OK Troops, You are starting to shape up and look like real F6 Troopers instead of a bunch of nasty cagers. Ready for something a little more advanced? Time to get the ole assault bike's binders working like new again. 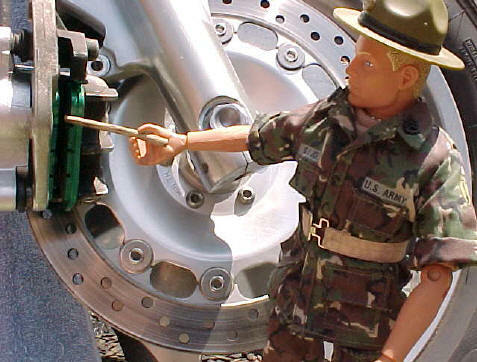 70 percent of a motorcycles stopping power is from the front brakes, so check-em often. 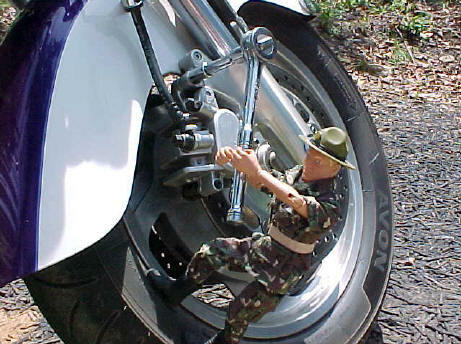 (once a week if you ride a lot) Checking the pads is easy troop...once you know how. 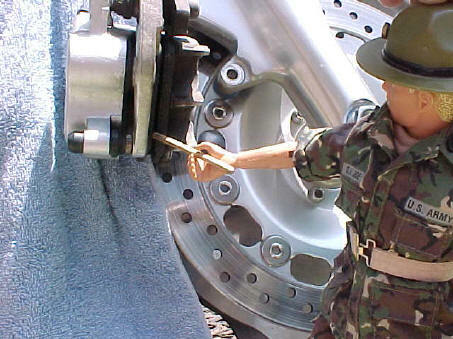 To check the pads just look past the rotor down into the brake caliper at the pads. See those grooves in the pads???? They aren't there to be stylish troop. When you can't see the grooves anymore it's time to replace the pads. If you've let the pads wear to the point where the metal backing plate is biting into the rotors then you'll be doing pushups till you're arms fall off . 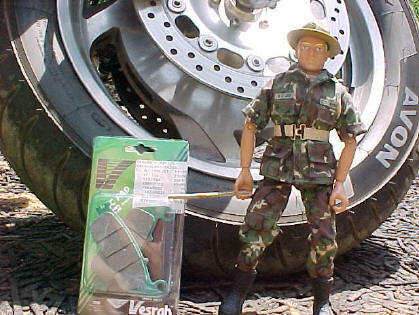 Then you'll have to fork out big bucks for new rotors. 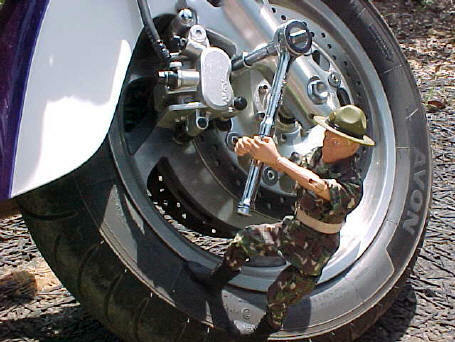 OK....on to the pad replacement........but first.............Sgt Joes P.T.!!! Decide which side of the bike you want to start on. Finish that side before starting on the other. First use the screwdriver to remove the gunmetal gray plug on the lower portion of the caliper, This will expose an allen (hex) head bolt underneath. Locate the proper size allen head wrench from your tool bag and loosen this bolt turning counter-clockwise, but don't remove it. Next use the ratchet extension and 12mm socket to loosen the 2 chrome bolts holding the caliper onto the mount. Pop the brake line from it's retainer and drape the towel over the fender to keep the caliper from scratching it. Remove the 2 chrome retaining bolts and turn the caliper so you can look at the pads. 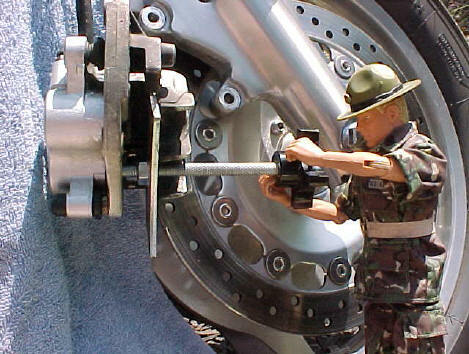 Observe how they are attached to the caliper. The top of the pad is inserted into a groove in the top of the caliper and a bolt runs through a hole in the bottom of the pad. Now use the allen head wrench to remove the bolt you loosened earlier and remove the pads. Take the c-clamp or caliper tool and press the pistons back into the caliper one at a time. Go gentle with em and they will slide right in with a little pressure. Take the new pads and insert the tab at the top into the groove in the caliper, and line up the holes in the caliper with the holes in the pads.......MAGGOT!!!!!!!!!! 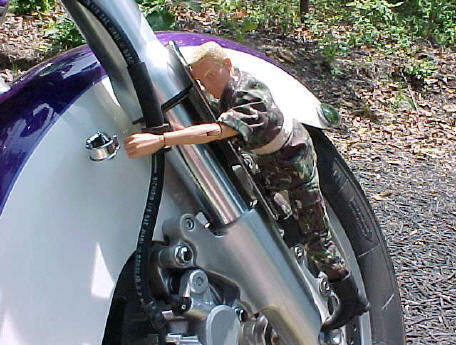 WHAT DO YOU THINK YOU'RE DOING TO MY BELOVED ASSAULT BIKE??????? THE KEVLAR PADS GO TO THE INSIDE!!!!!!!!!!! NOW DROP! DROP! DROP! Now put em back in there right! Put the allen head bolt back in to hold em in place but don't screw it in yet. 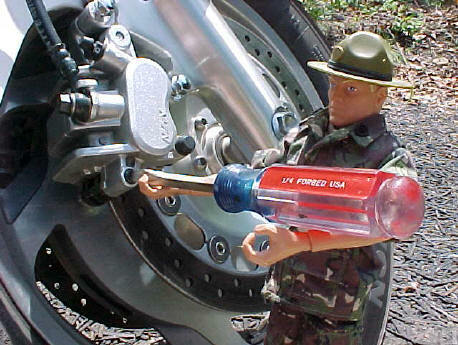 Take the lock-tite and put a drop on the threads of the bolt and screw it in all the way. Spread the new pads apart and position the caliper and pads over the rotor and on the mounting bracket. One pad on each side of the rotor. Put a drop....I said DROP PRIVATE! on each of the chrome bolts and run em in tight. Then finish tightening the allen head bolt holding the pads on, and screw the slotted plug back in. Now pop the brake line back into its retainer. Now repeat the process on the other side. 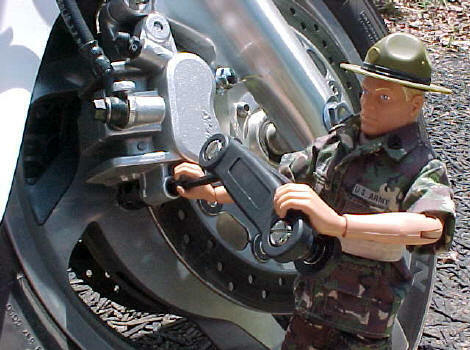 Before riding the assault bike out on your next mission make sure you pump the front brake lever (That's your military right numb-skull....the one in front of the throttle) several times to re-seat the pistons out of the calipers. You will feel brake pressure grow as you squeeze the lever. Congratulations Troops, You've just increased the chances of surviving your next mission.